I've been feeling like a slug for the past couple of days, a little unsure about the point when my body goes from "recovery" to "atrophy while eating Tostitos on the couch." I hit the gym today because I thought it would be good for my energy level to get my heart rate up without stressing my impact injuries. Can't say it helped, but at the same time - it didn't seem to hurt. And that led me to another question - if 72 hours after a 24-hour race, I feel well enough to run for an hour, maybe I didn't push myself hard enough during the race itself. But how do you make that decision? Where does "pushing hard" turn to "massive meltdown in the middle of the woods?" I am still dealing with Kincaid fallout. I'm beginning to wonder if I'll ever get the feeling back in my three middle fingers on my right hand - they're disconcertingly locked in that "asleep" phase that usually precludes the tingly feeling that leads back to normal circulation. I also regained that constant, sharp pain in my left shoulder, proving that it's not a camelbak injury, but rather a consequence of hanging over handlebars for 24 hours. As for my fingers - I blame the roots. At the same time, I do feel pretty good for just putting my body through the 16 circles of hell. It has me asking those "what if" questions, and I'm already formulating a plan for "next time:"
1. Race more competitively. Now that I know I can ride it out, I feel like it wouldn't take an unreasonable amount of effort to ride faster. 2. Take less chatty breaks. This goes with being more competitive. On Saturday and Sunday, I wasted a lot of time stopped at my camp, nibbling on sandwiches and chatting with Geoff. This added to the enjoyment of the race for sure, but did nothing for recovery and generally slowed down my progress. 3. Experiment with liquid nutrition. Peanut Butter Sandwiches, while delicious, just don't ride well over the long haul, I've learned. I probably don't need to elaborate. 4. Start keeping closer track of my progress. If I had decided to make a push beginning at 5 a.m. rather than 9 a.m., I could have easily completed 17 laps instead of 16. As it was, I came up only 10 minutes short. I already feel excited. It's amazing how quickly we forget the pain in the aftermath of one fleeting moment of triumph ... how I wasn't able to eat - and hardly drink - for the last 40 miles of the race as I struggled with sensations that my body was about to turn inside out ... how my forearms vibrated with intense pain as I flew over roots and rocks, unwilling to slow down and waste perfectly good gravity ... how after 18 hours in the same pair of sweaty shorts, I ended up with the equivalent of a diaper rash ... but that didn't matter anyway because I already had a saddle sore on the verge of bleeding. 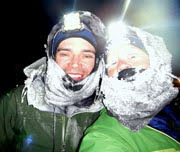 "We go into the Alaska backcountry to see if we have any cracks in ourselves. We go back a year later to see if we've done anything about them." I think you did great! Less chatting is always better. Even going very slow on the bike is better than standing and talking. Regarding your 'diaper rash' try coating your chamois in vaseline before the race and then apply Bag Balm to the specific 'hot spots' that develop. Works for me! Another (not so) secret of mine...try making your own gel for some semi-liquid fuel. Just mix brown rice syrup and black strap molasses in a 12:1 ration. Very good neutral flavor. I did less than one third of the distance you did, and I'm still not riding because my back's still a little stiff. But hey, the scabs are pealing and the weather outside is beautiful ... why not run or ride or do something? On the other hand, that is pretty creepy that you still can't feel those fingers. Don't wait too long before you get that checked, eh? Jill, active recovery is the key for us roadies. We ride easy our days off, and race and train hard the other days. It also helps to flush out the toxins from the muscles. As for your fingers, get them looked at in a day or so if no improvement. Also, try more padded gloves next time if you can. And in terms of shorts, try to change them every few hours if you have enough pairs. When I do multiple criteriums in a day, I use a different pair of shorts for each race. I can't add anything much to the comments above except that you're right, the endorphins do make for a strange endurance addiction in people! Congratulations! I knew you had it in you to do very well. Really believing in your training and ability really helps the mental battle. If you stay dry, I think you can go 24 hours with the same shorts but if you're getting wet you need to change more often. Assos Chamois Butter is the best stuff. For a 24 hour race you'll do better with all liquids and no solid foods. It took me a couple years to be convinced but I haven't gone back. Take some electrolyte replacement tabs like Endurolytes from Hammer. The time off the bike can make a really big difference. If you were chatting and munching, I can see you being off the bike 5-6 minutes per lap. That comes out to be nearly 1.5 hours over the 16 laps. It really does add up! 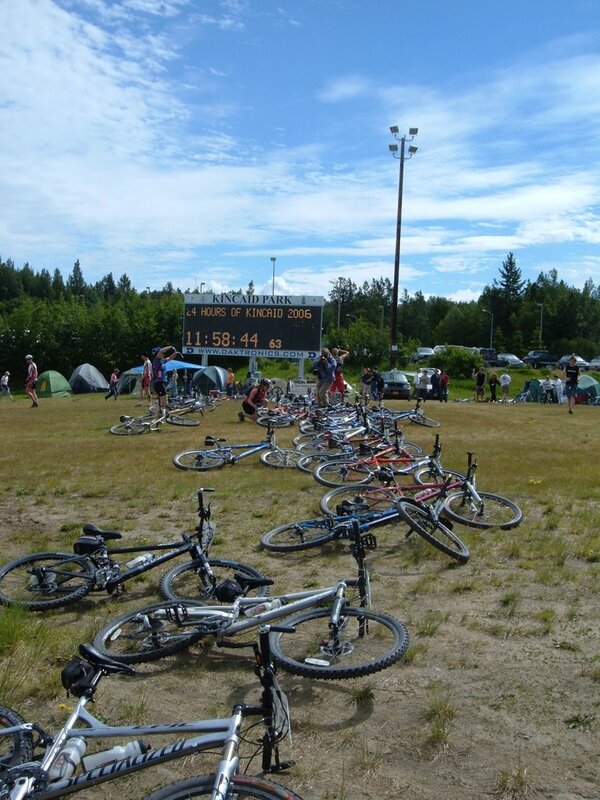 In the 2003 Fireweed 400, I was off the bike a total of 12 minutes in 22.5 hours. My longest break was 3 minutes which was to adjust my cleat. 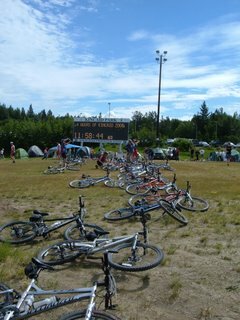 I also wasn't taking my asthma inhalers on the bike so I was stopping every 4 hours for a few seconds for those. Ahhh!! the best part about a lemans style start, is after you lay your bike down and walk away, the promoters have the right to move the bikes around and mess with your brain to make things unnecessarily more interesting.....weeeeee!!! !